- Pos = (V+)-2V min. (V+)-1.5V typ. - Neg = (V-)+2V min. 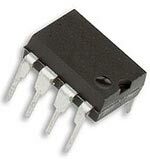 (V-)+1.2V typ. Common-Mode Rejection: 90dB min. ; 105dB typ. Low Offset Voltage: 1mV max. High Open-Loop Gain: 120dB min.